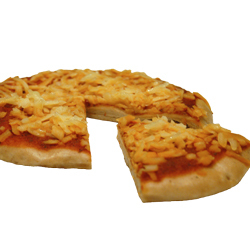 Description: Each package contains 3 complete crispy crust (5-inch diameter) cheese pizzas to simplify your meal routine. Ingredients: Crust: water, wheat starch, psyllium fiber, polydextrose, canola oil, sugar, leavening (sodium acid pyrophosphate, sodium bicarbonate, monocalcium phosphate), modified cellulose, xanthan gum, salt, yeast, calcium propionate (preservative), fumaric acid (preservative), sorbic acid (preservative). Topping: pizza sauce (tomatoes, salt, soybean oil, spices, extra virgin olive oil, garlic powder, citric acid), mozzarella (water, food starch, partially hydrogenated soybean oil, whey, salt, casein and/or caseinate, sodium phosphate, sorbic acid [preservative], carrageenan, natural flavor, lactic acid, artificial color [food starch, powdered cellulose, dextrose, glucose oxidase, added to prevent caking and to maintain freshness]), Italian seasoning. Contains milk, soy and wheat. From Rochelle of Junction City, Kansas on 4/13/2012 . From Rebecca Brown of Statesboro, Georgia on 8/11/2007 . From Laura Quintero of Tustin, California on 1/20/2007 . 7/30/2010 – How much of a cheese pizza is 5 ounces? It says 5ounces is a serving is that the entire pizza or just half?? trying to figureout . . .
8/16/2008 – Is the 5 oz serving equal to 1/4 of the cheese pizza?